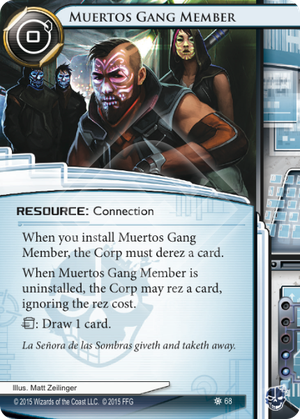 When you install Muertos Gang Member, the Corp must derez a card. When Muertos Gang Member is uninstalled, the Corp may rez a card, ignoring the rez cost. La Señora de las Sombras giveth and taketh away. Holy Jackson H Howard! Such a lack of enthusiasm for this card! Ok, I'm here to tell you that this card is cool. It is a typical case of a card that needs to be played correctly to get the most out of it. Rules first: Yes, in both cases it's the Corp that gets to decide which card gets rezzed and derezzed. This means they can chose to derez a Jackson Howard. Thay can chose to rez a Curtain Wall. But as a Runner, you get to chose when this happens. By careful manipulation of the board state, you can make sure that all of the Corporation choices are bad. That's all there is to it. Let us start with the 1st ability: derezing a card. Because they can derez a Jackson Howard, you obviously don't want to play this when there is a Jackson on board. Duh! Ideally, you want just one card to be rezzed and that card should be expensive. So it's a good idea to play this early on. An ideal play is to face-check into some beefy ETR ice like Lotus Field on turn 1. Bounce off it. Play Muertos. Bam! Corp is poor. You can run that server again. They will need a turn or two to recuperate. Plus, you exposed the ice and know exactly what to prepare for once they get their money back up. Even if the ice is an Eli 1.0, this is basically a 3-credit loss for a click. That is great on turn 1! It is especially good against Blue Sun: Powering the Future, which will rez expensive ice on their own using Oversight AI. Because of their ability this will often be their only rezzed ice and Muertos will be a direct counter to this. Moving on to the 2nd ability: trashing Muertos to allow the corp to rez a card. This seems bad. But it's actually not a big deal if everything has been already rezzed. For example, you can keep facechecking aggressively, forcing the corp to rez all of the ice. Once you do that, you can pop Muertos and they won't be able to rez anything. You mitigate the downside and get a cool card draw from this. Muertos has some neat synergies with a bunch of Criminal cards. Forged Activation Orders allows you to force a corp to rez and ice or trash it. Either way, it eliminates a potential rez target for the 2nd ability, allowing you to pop Muertos for card draw earlier. Leela Patel: Trained Pragmatist likes this as well. Playing Muertos gives targets for her Abilty even late in the game. In return, her ability removes targets for Muertos 2nd ability, allowing you to pop Muertos for card draw earlier once again. Silhouette: Stealth Operative is great at scouting ice. If the only unrezzed ice is cheap, you can safely pop Muertos and be sure it won't give the Corp much of a benefit. Armand "Geist" Walker: Tech Lord gets an additional card draw if you manage to pop it. Finally, they are a connection so you can tutor them when you need them with a Hostage and since they will be hanging around for a while, you might get them to boost your Calling in Favors. And yes, they are probably a good reason to get drunk on jank one evening and try that Blackguard + Silhouette: Stealth Operative combo that didn't work so well last time around. Muertos might be even fun out of faction! With Reina Roja: Freedom Fighter the derez has an additional sting. Valencia Estevez: The Angel of Cayambe may be using them to keep servers unrezzed so she can Blackmail into them. Instead of Forged Activation order you can play the under-played Cyber Threat. And of course, you might want to put them on an Off-Campus Apartment so you get even more card draw! Muertos certainly has a weakness against cheap ice like Pop-up Window, Pup or Quandary. Face-checking into this ice to derez it won't be a significant hindrance for the corp. It difficult to pull it off in terms of influence, but it might be worth thinking about Parasite to eliminate those targets. Another neat card to combine this with would be Social Engineering. If you can spot the expensive ice, this can put the Corp into quite a conundrum. If you want to crank up that jank, you can even play False Echo to eliminate targets for the 2nd ability. Another weakness of Muertos is that you can't go Tag-me. The corp will be able to play 2 credits to trash your Resources and rez stuff for free. So you want make sure you remove those Account Siphon tags as long as they are out. You might even play it with Fall Guy just to be sure. This would work well with the above mentioned connection plan. Armand would approve. Anyways, Muertos Gang Member is a cool, complex card. It offers great benefits if you are willing to play a strategic game. So don't put that in your folder yet! Have fun and experiment! krystman's review is great and covers so much of this card. I wanted to touch on one aspect that the other reviews haven't mentioned yet; this card, particularly with multiple copies installed, functions as cheap damage protection with an ulterior benefit. In Geist it's basically equivalent to I've Had Worse since you net two cards, nullifying the SEA Source->2x Scorched Earth combo if you have two on the board and a full hand. Since there's a paid abilities window after each action, you have a chance to pop Muertos Gang Member even if you become tagged on the corporation's turn. Sure, they may get to rez some expensive stuff, but at least you'll live. An interesting interaction with this card and Street Peddler. If the runner has Muertos Gang Member on a Street Peddler, and there is no other card rezzed, the following may happen. The Runner runs a piece of ice. The Corp chooses to rez that piece of ice. At the 3.1 Timing window. the runner uses Street Peddler to install Muertos Gang Member. This forcez the Corp to derez the ice, and the Subroutines are not allowed to fire. The Corp cannot rez the ice again, because the window for rezzing has passed, allowing the runner past. The trash ability is nice when when the corp has no cards unrezzed, or when you're sure that every one of their unrezzed cards are cheap. And if the install ability is ineffective, it's just as efficient to just click to draw for anyone but Geist. The only advantage you get is that you get to draw later instead of now, which might be useful if you need that one last card for Faust or if you're holding three cards and feel a Scorched Earth coming. But now if you get a tag, the Corp can install any card (say, Archer) then trash your gang member to rez their card for a total cost of 2. It's a situational card, but the situations where it's even marginally useful are pretty rare in my experience. This is an OK card in my opinion. Free to play, and also trashes for a draw. Just a small matter of playing around the cards "negative." Easily done, early game especially. It pairs well with Forged Activation Orders, in that you can play this at a time when you know the corp cannot afford to re-rez the ICE and get it totally trashed. This could really set the corp behind if you trash an early rez on R&D or HQ, especially if you can then trash this with impunity for a draw. That's some nice tempo gain. The important text in the second paragraph is ignoring the "rez" cost, so Archer feels really sad about this card. Also illicit ICE (Grim, Fenris, Checkpoint) all don't like this card either; either the corp pays the rez cost and takes the bad pub again, or just gives up and trashes the ICE for something else in a turn or two. Of course, this card hates tags, because a smart corp player is going to install that Heimdall 2.0 or The Root, then trash this for a free rez. ICE isn't just a target. Any asset that isn't free to rez is a good target, and you can then play Drive By to trash it outright. Janky, but cheaper than trashing a SanSan City Grid, anyway. If you target a free to rez asset, like #Jackson, in the hopes of trashing it with Drive By, the corp is just going to rez it right away in their rez window after your click is over, so for the love of god don't try and be clever and do that. This was a bad review and I wish I could delete it. The important thing to note is that the Corp derezzes and rezzes the card, not the runner. So they'll happily derez a Jackson, Contract Killer the Gang Member, then res a Curtain Wall. It's got some definite uses but it's still pretty janky.